Oceanographical temperature in Java Sea is very important to be considered. This research was combines in-site observation technique, Geographical Information System (GLS) and remote sensing in order to get accurate, present and updateable data. 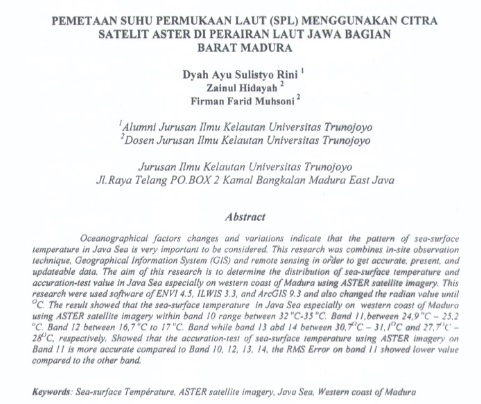 The aim of this research is to determine the distribution of sea-surface temperature and accuration-test value in Java Sea especially on western coast of Madura using ASTER satellite imagery. This research were used software of ENVI 4.5, ILWIS 3.3, and ArcGIS 9.3 and also changed the radian value until °C. Result showed that using ASTER satellite imagery within band 10 range between 32 "C-35 "C. Band 11,between 24.9"C 25,2"C. Band 12 between 16,7"C to 17"C. Band while band 13 abd 14 between 30.7, band 28. Band 11 is more accurate compared to Band 10, 12, 13. 14, the RMS Error on band 11 showed lower value compared to the other band.